I WANTED TO KNOW ABOUT MERCURY BAROMETER AND ANEROID BAROMETER FOR OUR GEOGRAPHY PROJECT , AND GOT IT HERE , NOW I WILL MAKE AN EXCELLENT PROJECT AND WILL SCORE GOOD MARKS IN PROJECT. Hmm That's a mistake it's 10.3 meters. Not 100.
thanx 4 the help in my lab mgt assignment at least you save me a whole lot of sweet. 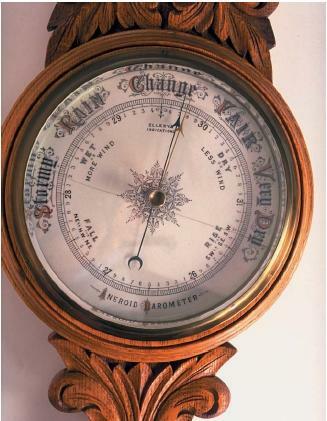 I am seeking information on how to regulate/work a watch style aneroid barometer with altimetre. Does it matter how far below the surface the bottom of the vertical tube is? Hallo.. Good evening. I wanted to know if water or any liquid will be used in place of mercury in barometer then what will happen? Thank you. What happens when water is used instead of mercury? What should be the length of the glass tube to make a water barometer? Provided complete information on Mercury barometer for my geography project. We can make a water barometer but we will require a 10 m tube for it.So huge for this experiment.My tution teacher told me about this.